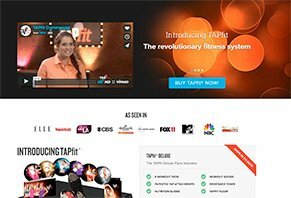 TAPFit Reviews - Is it a Scam or Legit? Using 40 large, compound movements often found in tap dancing, the TapFit workout system’s videos and guides can help you get the body you’ve always wanted. TAPfit is a home-based fitness system combines all the benefits of tap dancing, cardio, and resistance training into one easy-to-follow program that can help you achieve “maximum results for your body and brain.” In fact, TapFit can help you burn up to 800 calories per hour while having a blast! Whether you’re just getting back into fitness or have been regularly working out for years, the key to success is keeping your motivation at its peak. In order to do this though, you need to find something you truly enjoy about the process; and who doesn’t enjoy dancing? Although TapFit was designed by four sisters who are “revered as world championship contenders in tap dance,” not to mention renowned fitness instructors, anyone can start learning different tap styles in minutes, while targeting muscles all over their body. In short, with TapFit, you’ll be able to burn lots of calories, sculpt muscles, and gain access to nutrition and training guides developed by accredited exercise, diet, and medical professionals. Perhaps more than most, there’s often a lot of hype surrounding new fitness and weight loss programs. But in a lot of cases, customers quickly become bored and move on, while their expensive investments gathers dust. Will this be the case with TapFit? And even if it won’t, what kinds of results can you realistically expect? We’re here to answer all your important questions. Before we get to that though, let’s take a more in-depth look at the TapFit program. What’s Involved With the TapFit Program? The TapFit program is based on more than 40 large, compound movements found in tap dancing, which are performed on the toes of the feet with relaxed knees. This position accomplishes two major things: First, it activates muscle groups (specifically your gluteus maximus, gluteus medius, and gluteus minimus) that create “more of a calorie burn… than any other muscle group in the entire human body.” Second, you’ll be able to tone, shape, and define your quadriceps, hamstrings, and calves. Each high-definition TapFit video tackles a different dance and workout style over the course of 30 minutes (or less), including Broadway, Classic, Latin, Street, Funk, and Strengthen and Stretch. If you’re a beginner, TapFit’s videos feature “Learn It” sections that will walk you through each move and break down each step. This way, you can practice as many times as you like before beginning the workout videos. And even once you do, you’ll be able to choose between easy or moderate options. TapFit’s 3ft X 4ft floor mat is where you’ll be doing all your dancing, which is made from natural bamboo, so you’ll experience the best tap sound. Underneath the mat, you’ll find a non-slip fabric bottom that can be used on most floor types without causing damage. Then, when you’re finished with your TapFit workout, just fold or roll the mat and store. To use TapFit’s mat, you’ll slip a patented attachment onto your existing shoes, which contain solid stainless steel tap pieces “as used and designed by the Australian Tap Dancing Team.” This means you’ll be able to produce the best tap sound at the lowest possible volume (making it acceptable to use in an apartment), while the non-slip grip with keep everything in place. You’ll be able to access all TapFit workout DVDs online, along with trainer videos, new weekly workouts, diet guides developed by an accredited dietitian, easy-to-make meal plans, expert nutrition tips, and even plans that are tailored to your goals. Who’s Behind the TapFit Program? Annie has been involved in tap dancing for 20 years (10 of which she’s worked as a fully qualified tap instructor), teaching children, adults, and physically challenged young adults how to keep in shape and stay physically fit. Like Annie, Fiona also has 20 years of tap dancing experience, and is excited to help other improve the performance of their body and their brain through the creative expression of dance. After teaching tap dancing to a 9 year old girl with cerebral palsy, who was finally able to ride her bike for the first time after six months of lessons, Katherine understood that these benefits should be shared with the world. Katherine has also experienced these benefits first-hand, as tap dancing has helped her become stronger, fitter, lighter (she lost 20 pounds), and happier. Rachel is a full time accountant, which doesn’t leave her much time to work out. Because of this (as well as the fact that she’s performed at an elite level), she appreciates that TapFit’s workouts only take 30 minutes, and can help improve your body and your mind. Like the Johnson sisters, Matt has been dancing and performing for 20+ years all around the world, and continues to make TV appearances today. He brings his passion for strength and conditioning exercises, and for helping people achieve their fitness goals, to the TapFit team. How much will all this professional experience cost you? Will TapFit’s Price Make You Tap Out? 12-month access to the online TapFit community, complete with downloadable workouts so you can use the program on the go. Is Tap Dancing a Good Way to Work Out? Whether we’re talking about tap, ballet, swing, or any other style, dancing is a form of cardiovascular exercise. In other words, it elevates your heart rate to about 50% of its maximum level over an extended period of time. As a result, you can boost your metabolism, burn more calories, and start dropping inches. Dancing can be an especially effective form of cardio since much of what you’ll be doing involves compound movements, or those that engage “two or more different joints to fully stimulate entire muscle groups and, indeed, multiple muscles.” And when you consider TapFit’s Toner Bands, you’ll be able to add resistance training to the mix in order to work out your upper body as well. However, we didn’t uncover any research indicating that tap is more effective than other types of dancing. In fact, even the brain benefits mentioned on the TapFit website reference dancing in general—not just tap dancing. What’s this mean for you? While TapFit certainly appears enjoyable, high quality, and well-rounded (you’ll also gain access to nutrition information and meal plans), there doesn’t seem to be anything especially unique about tap dancing’s ability to improve your fitness or shed calories. Pro tip: Speaking of which, what about the “800 calories per hour” claim on the TapFit website? While there’s no citation to back this up, according to NutriStrategy.com, tap dancing only burns up to 419 calories per hour, depending on the individual’s weight. Is There Anything Revolutionary About TapFit? Remember how we talked about motivation at the beginning of this review? Because motivation is such an important factor in achieving our fitness goals—and because this source of motivation is constantly changing—there are fitness programs covering just about every imaginable topic. This includes dance-based programs like CIZE, and even tap-specific programs, which you can quickly find by typing “tap dancing exercise” or “tap dancing workout videos” into your nearest search engine. Will all of these be as robust as TapFit, including the accessories and guides? Certainly not, but many of these can be found for free on popular video websites, which might help you decide if you’d like to get fit with tap dancing, without spending any money upfront. Will TapFit Help You “Get the Body You’ve Always Wanted”? Are you just getting back into working out after a long absence, or are you already relatively fit? What’s your primary goal: weight loss, bigger muscles, or leaner, more defined muscles? Do you require (and want to pay for) meal plans and nutrition advice? Do you enjoy tap dancing, or are you better suited to another style of dance? Our opinion? We think TapFit’s likely ideal for those of us who are either just getting back into fitness, or those who might be a little further along on their fitness journey, but are looking for a new source of motivation. Either way though, will TapFit actually help you get the body you’ve always wanted? As long as you exercise regularly and eat a balanced diet, TapFit just might be a super-fun way of reaching your fitness goals and unleashing your new body. Is this what you experienced with TapFit? Tell us all about it by writing a review below! Write a Review for TAPFit!